Following a successful amateur career highlighted by victories in the 1992 British U-19 Championship and the 1993 Scottish Amateur Championship, Graeme turned professional at the start of the 1994/5 season. His first few years on the tour were unspectacular, though he did show consistent improvement and moved up into the top 32 for the first time at the end of the 1997/8 season. This steady pattern continued at the start of the next before he made an impressive run to his first ranking final at the Regal Scottish Open, beating John Parrott, Paul Hunter and Ken Doherty along the way. In the final itself however he was to be brought back down to earth with a bump, suffering a 9-1 mauling at the hands of compatriot Stephen Hendry. Still, the week was a good one overall and Graeme was to make his first competitive 147 a month later at the British Open, going on to end the season ranked at 25th. Although he continued to improve during the next season, reaching the Scottish semi-finals and his second appearance at the Crucible, defeat to Steve Davis in his final match of the season meant that a place in the top 16 would have to wait another year. It was to be just that one year though as another solid season in 2000/1 moved him up to 14th place, meaning that he no longer had to qualify for the final stages of events. This was expected to be the time when Graeme would kick on and establish himself in the top ten but things just did not seem to work out for him as his form dipped. Ultimately this was to culminate in him taking the decision to change his cue in the hope of a solution and on the advice of his manager, destroying his existing one at a service station so that he would never be tempted to go back to it. Remarkably, this was to prove to be something of a turning point for Graeme as just months later he reached his first World Championship final, eventually losing out 18-8 to Ronnie O’Sullivan despite having led 5-0 early on. Having been in danger of dropping out of the top 16 before the tournament however, this result was at least enough to keep him in the top 16 for another season. 2004/5 was steady if not spectacular, though he reached his third ranking event final in Malta where he came up short once again to countryman Stephen Hendry. Despite a disappointing defeat to Ian McCulloch at the World Championship he was able to remain inside the top 16, eventually finishing 15th. Entering the 2006 World Championship, few were tipping Graeme as one of the favourites but following victories against John Parrot, Nigel Bond and Neil Robertson in the early rounds he found himself up against O’Sullivan again at the Crucible in the semi-final. With the match level at 8-8 and Ronnie struggling with the tip of his cue, Graeme remarkably won all eight frames in the third session of the match to put himself just one away from the a place in the final. 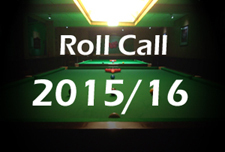 Although O’Sullivan rallied in the evening, it was to be Graeme’s night and he took the victory, 17-11. This time in the final Graeme found himself up against 2002 champion Peter Ebdon and carried on where he left off against O’Sullivan, moving to a 15-7 lead at the start of the final session. In what was an epic session for the tension if not the quality of snooker, Ebdon won the first six frames of the night to move within two frames, but Dott held his nerve to close out the match 18-14. Given where he had been just over two years previously when in that Welsh service station, this was a fantastic achievement for the Scot and moved him up to number 6 in the rankings. 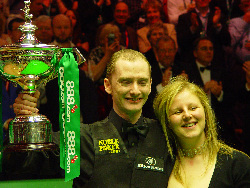 In 2006/7 Dott was to have a mixed season, reaching the UK semi-finals before losing out yet again to Hendry, as well as taking his second ranking event title at the China Open. His prospects of becoming the new world number one were to end in an extremely disappointing fashion however as his defence of his world title ended on the opening day of the 2007 World Championship with defeat to nemesis Ian McCulloch. As a result, Dott had to settle for second in the rankings, albeit a new career high. From this high, 2007/8 was to be something of a disaster as Dott failed to win a single ranking event match after the season opening Shanghai Masters. 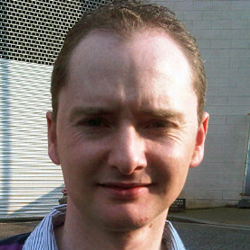 With various tragic events occurring in his personal life, Graeme was to receive treatment for depression and it was clear to see that he was not right on the table. Although he retained his place in the top 16 at the end of the season, he left himself facing an uphill battle to even retain his top 32 place for the 2009/10 season. Having won a World Series event in Berlin over the summer, Graeme entered the 2008/9 season looking to be in better shape, but unfortunately another set-back was to be just around the corner. During a football match between the players taking place prior to the start of the Shanghai Masters, Graeme suffered a broken wrist which meant that he would not only miss that tournament, but the subsequent Grand Prix as well. He returned for the Bahrain Championship in November but despite making a century, he lost out to Barry Pinches as his slide down the rankings continued. Finally he did manage to win a match at a ranking event in the UK Championship as he defeated former world champion Ken Doherty to reach the last 16. 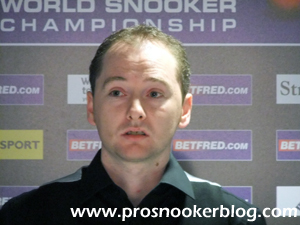 Though he lost out to Mark Williams in the next round, it was clear that Graeme was looking much better and this has continued in the following events as he looked to retain a place in the top 32. Further improvement came in Newport as he pushed eventual winner Ali Carter hard in the Welsh Open and his improvement was to be rewarded with a run to the quarter-finals in China, including a terrific win over Mark Selby along the way. Next up was the World Championship and needing at least one win to secure his top 32 status for next season, he duly delivered with a 10-8 victory over Barry Hawkins before Selby exacted swift revenge for that Beijing defeat in the last 16. 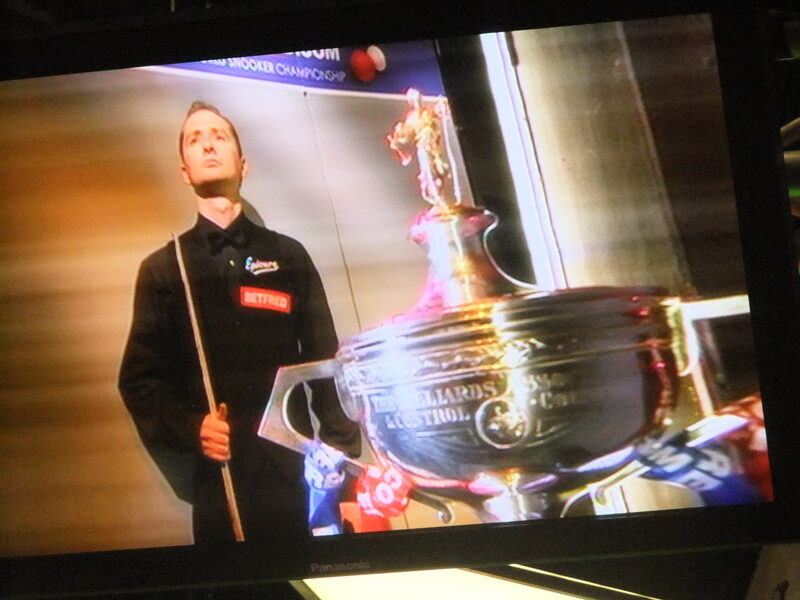 Graeme’s preparations for the 2009/10 season got off to the worst possible start as his cue, that which took him to the 2006 world title, was damaged beyond repair at an airport just a couple of weeks before his opening match at the Shanghai Masters. Nevertheless he was able to fight back from 4-1 down against Jimmy Robertson to qualify for the tournament, though once there he could do little to stop eventual champion Ronnie O’Sullivan who recorded a 5-0 whitewash. Bizarrely his next match saw him suffer a second straight whitewash, this time at the hands of countryman Jamie Burnett before he got his season back on track with a hard fought victory over Craig Steadman at the UK Championship qualifiers. Unfortunately however he could go no further as he was forced to retire from his last 32 match with Mark Williams due as he suffered from dizzy spells. Graeme’s form began to improve during the second half of the season as he reached the last 16 of the Welsh Open with victories over Ken Doherty and Joe Perry before he also managed to qualify for the China Open with another victory over Doherty. 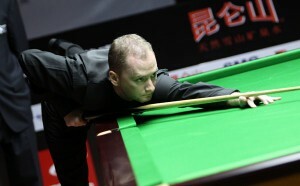 Despite the improvement in Graeme’s game however, he entered the World Championship qualifiers ranked outside of the top 16 provisionally and with the likes of competitors Peter Ebdon, Marco Fu and Jamie Cope all winning matches, needed a strong run to give himself any chance of reclaiming his place among the elite at the first attempt. His campaign could not have begun in a more strange way however as in his qualifying match against Jimmy Michie it soon became clear that there were problems with the table in Sheffield as demonstrated on the video below! Despite the issues however, Graeme eventually recovered from 3-1 down early on to record a 10-5 victory over Michie to book his place at the Crucible for an 11th consecutive year. There he would face old rival Ebdon in what promised to be a tough battle as the loser would be certain to finish the season ranked outside of the top 16 and in Peter’s favour was the fact that despite his loss in the 2006 final, he actually held a 7-1 head to head advantage over Graeme overall. What was to follow from Graeme however was an outstanding performance, particularly in the first session when he played with a speed and fluency that he had I had not seen from him before. 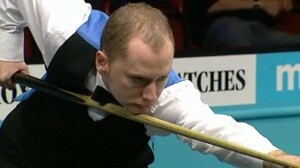 His long potting was particularly impressive and he duly scored a 10-5 victory to keep his bid alive. His run was not to end there however as he demolished world number two Stephen Maguire in the last 16 before recovering from 4-0 and 12-10 down against the in-form Mark Allen to progress to the semi-finals of the event and in the process secure his return to the top 16 in fine style. 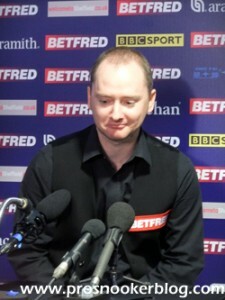 “Never mind Ali Carter or even Mark Selby – the man who has impressed me most is still Graeme Dott. After everything he’s been through it’s remarkable. He had everything to lose in terms of his top-16 place if he didn’t make the semi-finals. I’ve heard a few experts saying he’s back to his world title form of 2006. But that’s rubbish. Graeme never played like this. 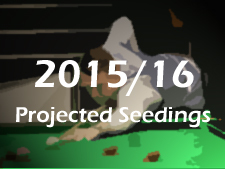 He’s speeded up, he’s attacking and he is out-potting his opponents. Nevertheless, up against Mark Selby who had already beaten three former champions to reach this stage, Graeme entered his semi-final as the underdog with the bookmakers. After an enthralling clash which contained surely the best safety play of the tournament however, it was Graeme who was able to fend off his higher ranked opponent and book his place in his third Crucible final. There he would face Australia’s Neil Robertson, a player who Graeme had defeated on his way to glory in 2006 as well as on their other previous two occasions. In a match of relatively low quality however, thanks in part due to Graeme’s gruelling clash with Selby and some bizarre scheduling, it was Neil who managed to lead by two frames at 9-7 following the opening day’s play. Although Dott hung in there with the determination that you would expect from him, he could never quite bridge the gap and by the end had absolutely nothing left to give as he slipped to an 18-13 defeat. Despite the obvious disappointment however, Graeme could be proud of his efforts as to defeat the calibre of players that he did to reach the final was no mean feat. More than the results however, it was the way in which Graeme played to earn them that impressed the most. Graeme made a solid start to the 2010/11 season as he defeated former world champions Ken Doherty and Mark Williams to reach the last eight of the Shanghai Masters before surprisingly losing out 5-2 to Stoke’s Jamie Cope. Narrow defeats to Neil Robertson and then John Higgins followed before Graeme embarked on another strong run to the semi-finals of the German Masters before losing 6-4 to Mark Selby. A quarter-final at the Welsh Open was to follow before he matched that result at the World Championship before losing out to an inspired Judd Trump who was to go all the way to the final. Graeme’s tournament however will be remembered for his excellent last 16 match against Ali Carter that he eventually edged 13-11 despite some heavy scoring from his opponent. Graeme’s consistency was at least enough to reward him with a rise of three places in the rankings over the course of the season to 10th position. Graeme was to enjoy a strong start to the 2011/12 season during the PTC events, reaching one final at PTC3 as well as the semi-finals of a further three events. He also reached the final of the invitational Brazilian Masters tournament where he was to lose out to an inspired Shaun Murphy. His results during the full-ranking events however were not to be as impressive, an opening round defeat at the Shanghai Masters as well as a last 16 exit at the UK Championship to Neil Robertson restricting his climb up the rankings. The second half of his season was to be little better as a quarter-final run at the Haikou World Open and an appearance in the final of the Snooker Shoot Out aside, he was to struggle to find his best form. This would ultimately culminate in a 10-1 defeat to Joe Perry at the World Championship during which Graeme produced surely one of his worst performances as a professional. Improvement was to come at the start of the 2012/13 season as Graeme reached the quarter-finals of both the Wuxi Classic and Shanghai Masters tournaments, losing out to Mark Davis and Judd Trump respectively. “I’ve not been happy for a while…I mean I just don’t think that I’m the same player I was. I’ve not played anywhere near the way I played in 2010 at the World Championship and if anything I have probably got worse than I was then. Better was to come in 2013 however, as Graeme began the year with a run to the semi-finals of the Masters, defeating Stephen Maguire and Judd Trump, before a marathon match with eventual champion Mark Selby 6-5. From there his season was to end with a run of second round defeats, most notably at the Crucible where having survived a gruelling opening match with old rival Peter Ebdon, he then lost a more entertaining clash with Shaun Murphy 13-11. 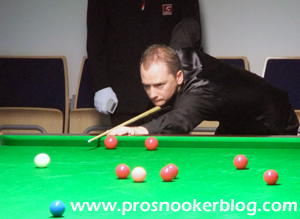 Having been to see old coach Del Hill shortly before the World Championship however, Graeme would head into 2013/14 with his game in a stronger place. Graeme was to enjoy an improved campaign in 2013/14, his strongest run coming at the International Championship in Chengdu, where he reached his first ranking event semi-final in two and a half years, before losing out 9-7 to eventual champion Ding Junhui. He was also to reach the quarter-finals of the Haikou World Open and China Open tournaments towards the end of the season, while he reached the semi-finals of the European Tour 6 event in Gloucester and the invitational Shoot Out event in Blackpool. 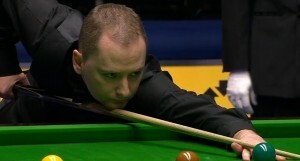 Though Graeme’s season was to end with a disappointing defeat to an inspired Kyren Wilson at the World Championship qualifiers in April, meaning that Graeme would not appear at the Crucible for the first time since 1999, he was able to finish ranked 17th, with the chance to climb higher during the following season. The 2014/15 season was to prove solid for Graeme as he reached the quarter-finals of both the Shanghai Masters and UK Championship events, defeating Neil Robertson 6-5 in the latter before losing by the same scoreline to Stuart Bingham. He also reached the last 16 of the Indian Open in Mumbai, as well as the World Championship as having made it through qualifying to return to the Crucible, he then knocked out Ricky Walden 10-8, only to lose to eventual champion Bingham in the second round. Dott would finish the season down one place in the rankings in 18th.